Agonda Beach is located in Canacona taluk, near Palolem beach (37 km away from Margao) in Goa. The beach is popular on the weekends among locals, but almost unheard of for Indian tourists from outside Goa. 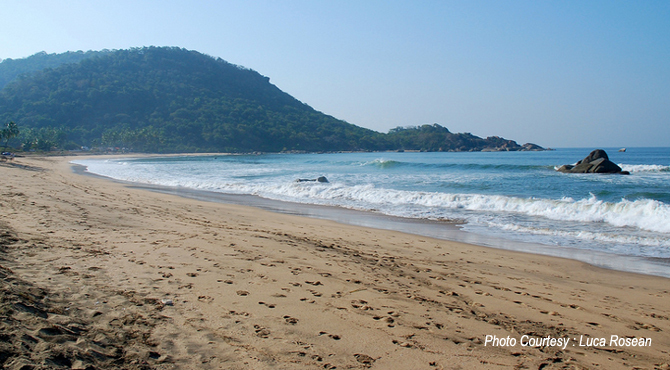 One of the most isolated beaches of South Goa, it is also known as the Silent Beach. This beach is not so popular because of it's quite tricky to reach and it's openness (which makes it less picturesque ). But it is a favourite haunt for the tourists who seeks serenity. The beach is 3 km long and has stretches of white sands lined with palm and casuarina trees. There are very few facilities available at the Agonda Beach. One can see Dolphins jumping out from the water. The Agonda Panchayat is very keen to keeping this beach as dark and quiet at night because the beach is a Turtle nesting site. The beach is also offers swimming, sunbathing and many alike to the tourists. But don’t go in more than waist-deep because the beach is considered to have a dodgy undertow and there is no lifeguard. It is an ideal place for surfing especially for beginners. The nearby Cabo da Rama fort is a major attraction for tourists visiting Agonda beach. It is around 12 Kms to the south of Cabo de Rama. The main attraction of Agonda Beach is Cabo de Rama. It is the hill of Cabo De Rama where the Portuguese have built a fort. The fort, now in a state of ruins, houses the beautiful church of Santo Antonio and presents an impressive sights of the sea. Named after the hero fo the Hindu epic Ramayana, Lord Rama. The fort is known as the abode of Rama for 12 long years during his exile. The ambiance of the castle generates a touch of history that that narrates the bygone eras. Cabo De Rama is now houses the gorgeous cathedral of Santo Antonio. The Directorate of Archives and Archaeology had been looking after the monument since 1973 because of its historic importance.